Throughout 2014 SMS CEO Adam Gordon and Martin Lee, our Director of Sourcing & Research, will be running monthly social media workshops for in-house talent acquisition professionals. The subjects will become more complex throughout the year so it will be a good opportunity for participants to develop their knowledge in layers. 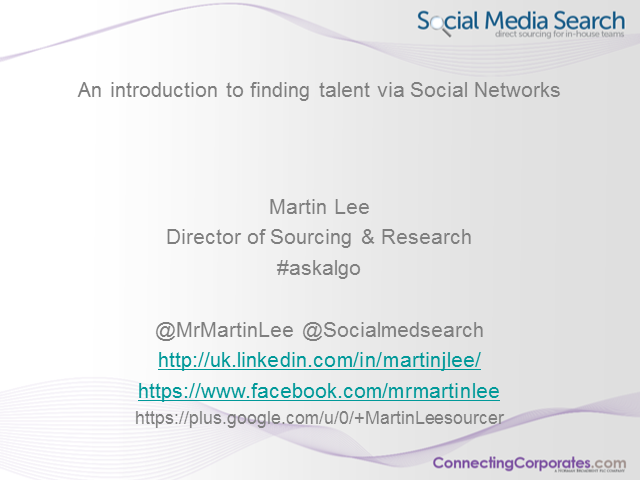 In this session Adam Gordon and Martin Lee from Social Media Search will be giving an introduction to a number of social and professional networks looking specifically at searching to uncover profiles and how to engage with the identified candidates. They will give practical demonstrations on different research techniques showing the variety of information that can be uncovered.